Keep this thermoplastic tape on hand for fix-its and patch-ups, to create a custom grip, or to do some heavy-duty jobs. The self-bonding tape is lightweight and flexible and becomes moldable (and remoldable) with heat. It hardens in minutes and has a tensile strength of over 1,000 pounds. Just heat, press, and repeat. Made in Maine. Single ribbon has tensile strength of over 1,000 lbs. Dimensions: 20' x 0.9" x 0.01"
A must have for household repairs! Forj thermoplastic tape Maker Joel Dyksterhouse is a composites engineer and he was always interested in exploring different material applications. When he first created the tape, he took it on a weekend hunting trip to try out—and it was soon all used up. The flexible, lightweight, and self-bonding tape repaired a canoe and worked as a tie-down strap during Joel’s trip, and it’s a versatile and durable fix for almost-endless situations. 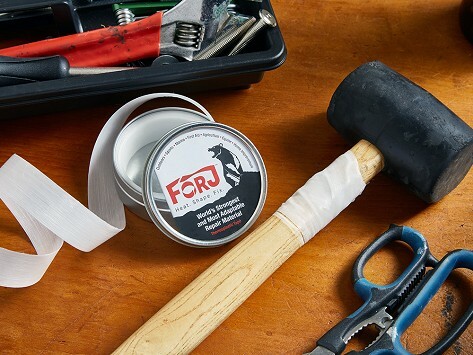 All that super-tough fixing, patching, and custom grip-creating power comes from thermoplastic fibers and thermoplastic polymermatrix that give the tape a tensile strength of over 1,000 pounds. Just heat, press, and repeat to mold the tape to suit your job.